Do you want custom textures for your game Minecraft Pocket Edition? 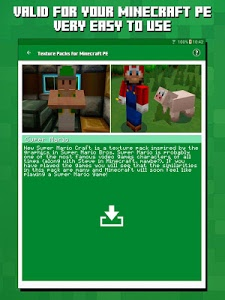 This application allows you to have those Texture Packs for Minecraft custom! Textures are automatically downloaded and installed, you can play with the textures in Minecraft PE in seconds! 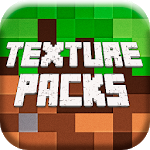 With this application you can explore an amazing collection of the best packs MCPE textures for your game. 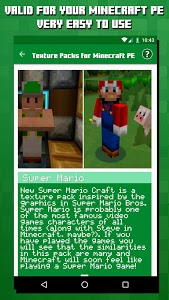 You will always have available the most comprehensive database of textures for Minecraft PE. This application contains thousands handpicked with photos and descriptions textures. 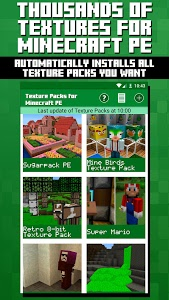 It is the app with more textures packs all PlayStore, we got them all! We update every hour minecraft textures and you can access the most famous world textures. 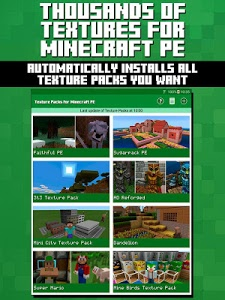 Similar to "Texture Packs for Minecraft PE"